It's a monster! Engineered to incorporate unique features and increased versatility right out-of-the-box, this heavy duty Arbor Press gets the job done like no other. 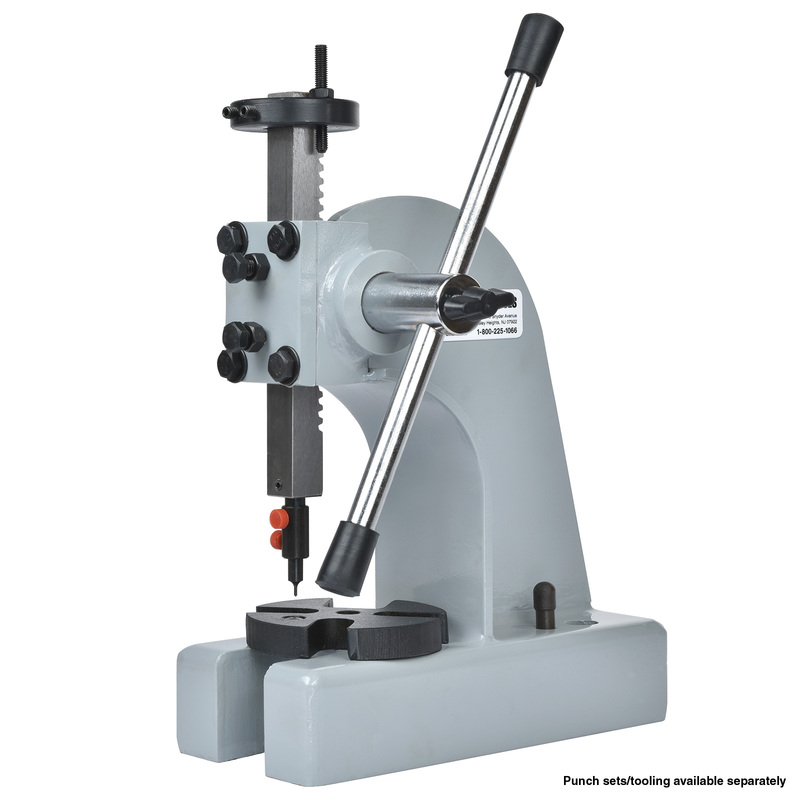 There are other models on the market, but ours is the first to include a specially designed locking work table that not only rotates 360 degrees, but can be positioned up to 3/32" from center (3/16" total travel) anywhere within the X and Y planes. This makes "jigging" of the press for special applications easier than ever before, along with providing the precision detail adjustment needed to "land-the-ram" exactly and repeatedly when your work calls for off-center pressing. Other innovations include on-board tooling storage, and a special adapter designed to hold our highly useful punch and die sets, which are available separately. • Overall dimensions: 11" x 9" x 4"
Punch parts, press gears and pinions, form parts, punch holes, manipulate components, flatten parts, create contours, create simulated rivets, emboss metals and other materials with provided tooling and create optional attachments using Micro Mark 82090 Rubber and cast those parts with High Strength Resin CR900 (82659) and then attach them to the Ram for customized applications. <br>Makes checking impressions easy and makes it a lot easier to get uniform results by allowing you to lower and re-strike your piece.